Here’s a quick look at some of the items the College Station City Council will be discussing at its workshop and regular meetings on Thursday, Aug. 9. This blog is not the complete and official agenda. The council will receive a presentation on the city’s proposed Fiscal Year 2013 budget. A public hearing will be Aug. 23, and the council is set to adopt the budget on Sept. 13. The council will review the proposed budget at a series of workshops scheduled for Aug. 16-17 and Aug. 20-21. The council will review the Brazos Valley Solid Waste Management Agency’s proposed FY13 budget, which was approved by the BVSWMA Board of Directors in June. Revenues are expected to be more than $6.45 million with expenses at more than $9.36 million. The council will consider transferring the duties and responsibilities of the city’s Cemetery Committee to the city manager or his delegate. In June, the Sunset Advisory Commission reported that Cemetery Committee meetings were infrequent and that major projects were complete. The council will consider approving the FY13 Community Development Action Plan and Budget, which it reviewed in June. Amounts available include $978,155 in Community Development Block Grant (CDBG) funds, $408,875 in HOME Investment Partnership Grant (HOME) funds, and various carryover amounts from past allocations. CDBG and HOME funds can only be used to benefit low- and moderate-income people, aid in the elimination of slum and blighting influences, or meet an urgent need. In addition, CDBG funds can be used to meet local needs through community development activities, while HOME funds can only be used for affordable housing activities. Historically, the city has used these funds for affordable housing programs, services to low-income families, and improvements to parks, streets, infrastructure and public facilities in low-income areas. The council will consider a contract for $194,298.40 with Dudley Construction for the Wolf Pen Creek Erosion Control Project. Natural processes have caused erosion in some areas of Wolf Pen Creek. This is the first phase of projects to address erosion and slope stabilization issues that threaten existing infrastructure along the upper trails. The project includes grading, the installation of interlocking blocks and turf reinforcement mats for slope stabilization, and the re-establishment of vegetation as erosion control measures. The council will consider calling a public hearing on the city’s proposed budget on Aug. 23 at 7 p.m. at city hall. After the public hearing, the council may make budget changes as long as the revisions don’t increase the total budget by more than 3 percent. The council will consider proceeding with the design of the Lick Creek Greenway Trail project using the consultant’s preferred alignment for Segment B (State Highway 6 to Fitch Parkway) and Segment C (Fitch to Lick Creek Park), and an on-street option for Segment A (Creek View Park to State Highway 6). In the 2008 bond election, voters approved the project to include about 4 miles of multi-use paths along Lick Creek from Creek View-Westfield Park to Lick Creek Park. The trail would connect residential neighborhoods and College Station Independent School District property. In April, a majority of the Springbrook Homeowners Association voted to allow its board to negotiate the dedication of about 18 acres of common area it owned to allow for the trail’s construction. Some homeowners expressed strong opposition to the land dedication, and in May, the council asked staff to allow the HOA 60 more days to explore the issue. Since the issues apparently remain, staff is recommending that the project proceed using the on-street option for Segment A instead of the alignment through the common area. The council will receive a presentation on the condition of the College Station Conference Center, which was closed in early July for safety reasons. In May, the city hired Hawkins Architecture to evaluate the facility and prepare a cost estimate for updates and corrections. On July 5, the firm notified the city of that the facility had significant structural issues and recommended that it be closed. The council will consider ordering a general and special election for Nov. 6 to elect two city council members (places 4 and 6), and to submit proposed City Charter amendments to the voters. The ordinance would also establish early voting locations and polling places, and make provisions for conducting the election. The city will have to pay proportionate expenses in the election. The council will consider changes to the city’s Park Land Dedication and Development Fees. The proposed Community Park Development fees were derived from giving developers a 75 percent discount on the cost of single-family community park development. The multi-family development fee was calculated at 50 percent of the cost. The calculations reflect new neighborhood and community park standards in which neighborhood parks have less intense development and community parks support more intense activity. Overall fees would go down, with single-family seeing the most significant decrease. The council will consider revising city code regarding sidewalk placement and width. In the last year, city staff has had regular meetings with the local homebuilders association and other development interests to discuss standards and practices in the development process. The council will receive a report from the Ad Hoc Committee for Compensation and Benefits, which was created in May to review the city’s compensation and benefit policies. Compensation costs make up the largest portion of the city’s operating budget, with total costs of more than $60 million in FY12. 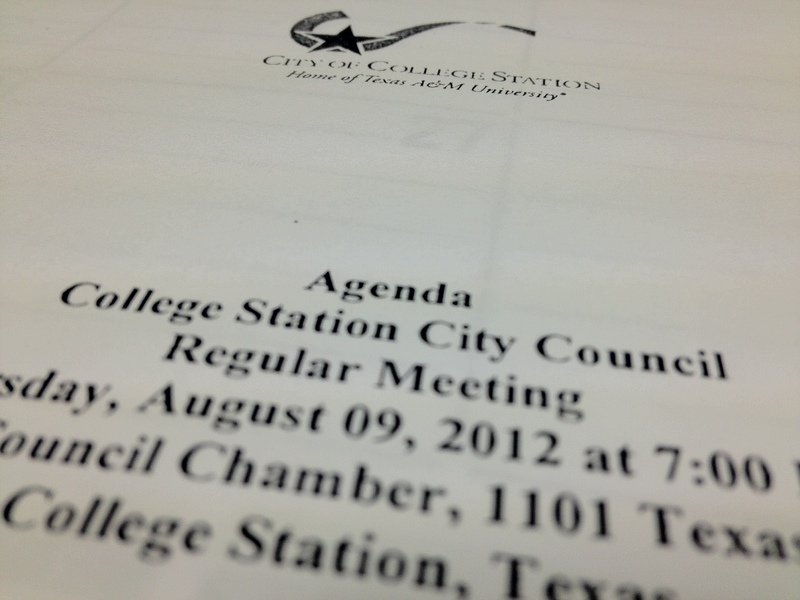 This entry was posted on August 6, 2012 by City of College Station. It was filed under City Council, Public Communications and was tagged with budget, BVSWMA, city charter, community development, Conference Center, Council Meetings, elections, Lick Creek Greenways Trail, Park Land Dedication Fees, Wolf Pen Creek.